4th Window: Subject- The Angel crowning the faithful warrior; Manufacturer- Abbot & Co.
Millennium Window: Explanation of Symbolism, (window installed in the year 2000): The dark lower part of the window creates an area of turmoil and the window rises through an area of calm to a glorious celebration of light in the upper part. The reaching hands can be interpreted in a number of ways: reaching for the rope of salvation; stretching out to greet the “Light of the World” or ringing in the celebration of 2000 years of faith. The bell wheel, appearing almost as a shadow behind The Light, notes the parish’s wish to mark the millennium through new bells and glass. The Light sends streams of enlightenment through the whole window. Lead lines and lighter coloured glass indicate the sail in the centre of the design recognizing the connection of Whitehaven with the sea, the Light of the Word being carried across the ocean to all corners of the world. Leonard Evetts was born in Newport (Wales) in 1909. He was initially a signwriter, and as such was an accomplished calligraphist. 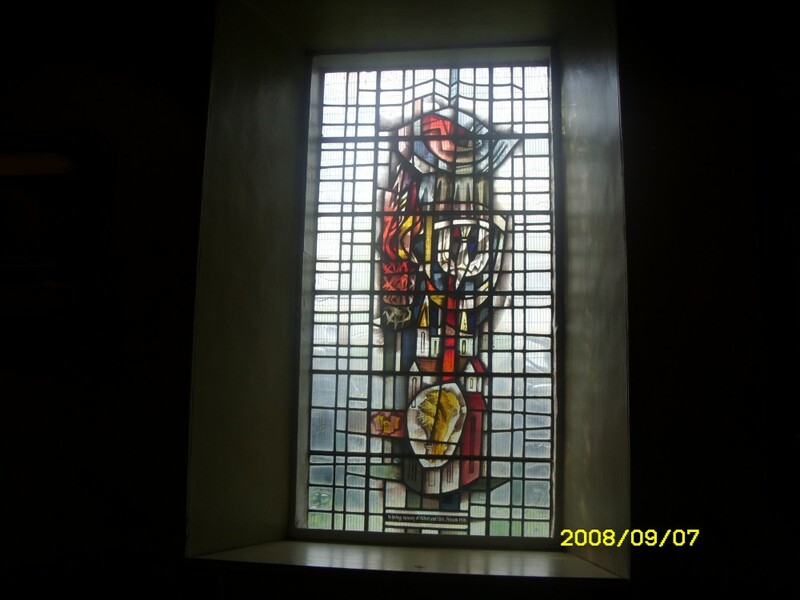 He became interested in Stained glass while studying at the RCA in the 1930’s. 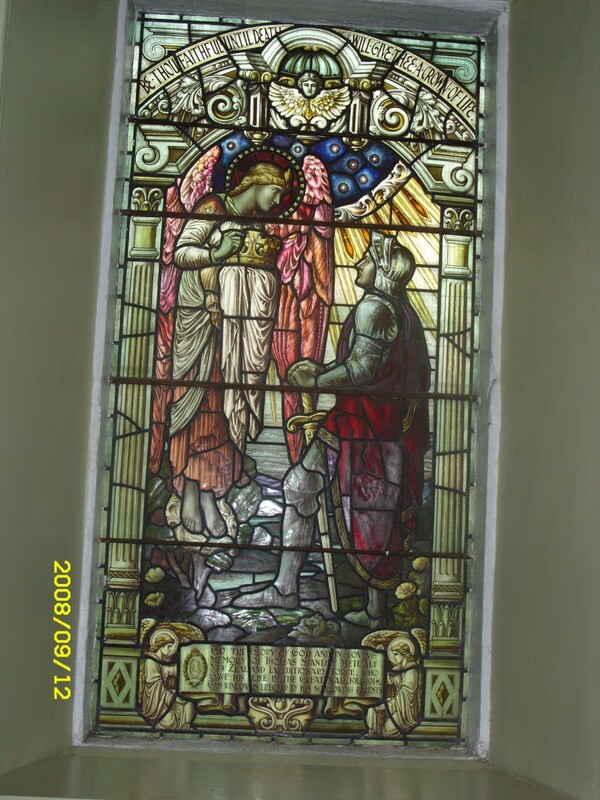 After World War 2 he became the most significant Stained Glass designer in the country with over 400 pieces to his name- 40 of which are in a single Church- St. Nicholas, Bishopwearmouth. 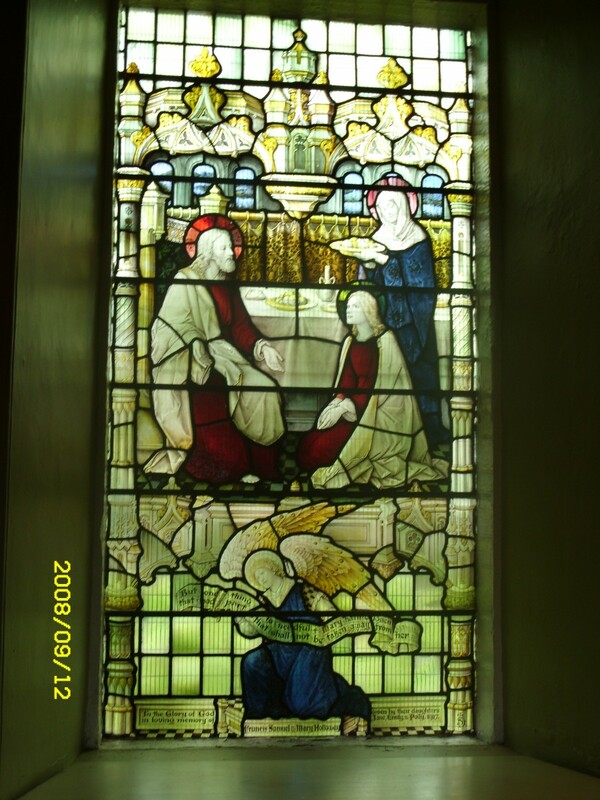 There is also an important window of his in Grantham St. Wulfram’s Church- depicting the seven sacraments of the church (1969). He taught at Newcastle University from 1937 to 1977, rising to Head of Design. He was also an outstanding watercolourist in the Impressionist style. He died in 1997, 10 days after completing his last commission, for Craster Church, and is buried at Bywell St. Peter, Northumberland. Baptistry Window: Subject- The Crucifixion; Manufacturer- Wm. Wailes, 1873. Inscription: In Memory of William Jackson of Whitehaven, died May 28th, 1870, aged 37. William Wailes was born in 1808 in Newcastle on Tyne. His first business was as grocer and tea merchant. 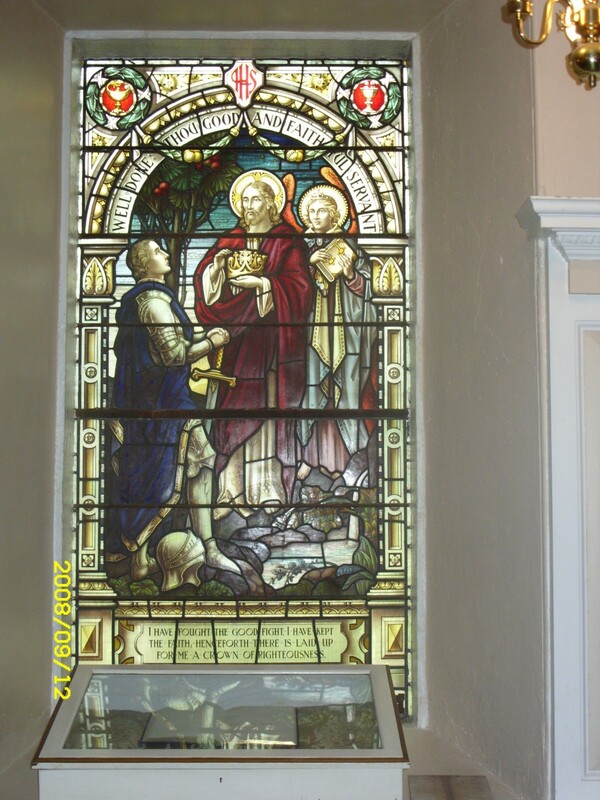 He studied stained glass under Mayer of Munich in 1830, and started manufacture in Newcastle in 1841. He concentrated on Medieval revivalism in his glass. At the peak the business employed 76 people and exhibited at the 1851 Crystal Palace Exhibition. His son in law became partner in 1861 when the business became Wailes and Strang. Wailes died in 1881, although the company continued in being until 1914. Saltwell Park. in the City, is his former home & estate (he bought the land in 1860 and built the mansion and landscaped the grounds). The estate was sold to the city in 1876 upon Waile’s bankruptcy since when it has been public parkland, although he continued to reside in the house until his death. He used paler and brighter colour schemes (especially using pink) than were common in England at the time, more akin to German and Limoges styles, and used ornate foliate patterns which give the distinctive character of painted manuscripts. Probably his greatest work is the West window of Gloucester Cathedral, completed in 1859. Shrigley and Hunt was founded in 1873, not the 1750‘s as some sources state- the confusion arises from the fact that the separate companies of Shrigley of Lancaster (a painter and gilder) and Hunt of Hoddesdon, Herts (a general builder) both trace their beginnings to that earlier date, but the stained glass company with the combined name only dates from 1859. It was founded by Arthur William Hunt (1849-1917). How the two families came to know each other is obscure- but probably dates from a joint contract in London. Hunt was initially the manager of Shrigleys, but he bought the company out upon the death of Joseph Shrigley, using a sizeable legacy from his new wife Jane (whom he married at St. George’s, Kensington on 9th June 1874). The works was established at 23, Castle Hill, Lancaster where it remained until 1959. Hunt moved to a new home at 27, West Road Lancaster in 1873 until he built his new home “Longlands” in 1884. Between 1875 and 1895 they had 12 children (three of whom died in childhood)- the 9 survivors were 2 girls and 7 boys. In the earliest years he employed freelance designers, but soon secured the services of the Swede Carl Almquist (1848 to 1924) and Edward Holmes Jewitt (1849-1929)- both remained with the company until blindness (in 1922) and death respectively. Almquist primarily worked from the company’s London office. Manufacture was subcontracted out until kilns were installed at Castle Hill in 1875- these are still in the building. In 1875 the company described itself as Church and House Painters and Decorators, Paperhangers, Carvers and Gilders, Stained Glass and Heraldic Painters. Most of these other peripheral activities did not survive far beyond the Victorian Era (at least in the secular sector), and included producing hand painted tiles (primarily for houses, but occasionally for Church Sanctuaries). This became uneconomical when mass produced pottery was introduced around 1900. Church mural painting survived for rather longer- although few examples survive owing to the ravages of time and changing taste. 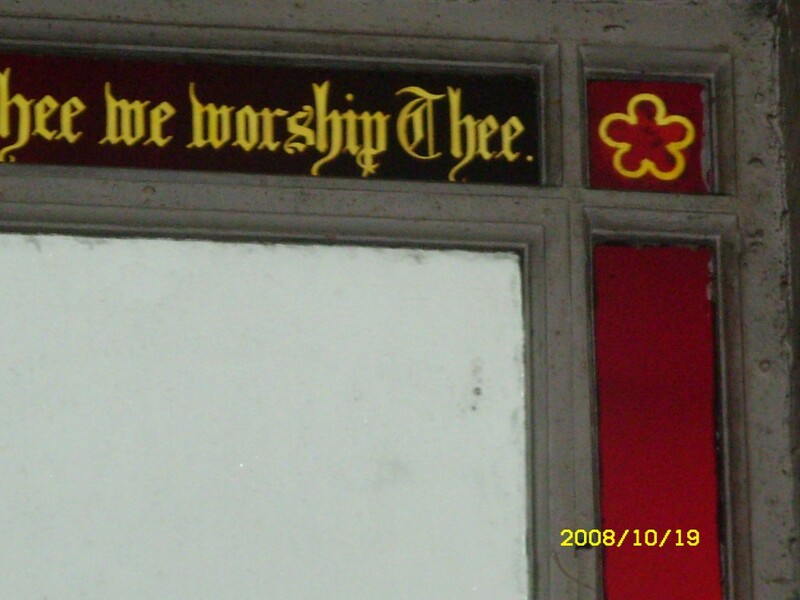 There was a fine example in Westmorland at Crosby Ravensworth, but the closest is now at St. George‘s Church, Preston. The business generally did not advertise, relying on steady work from certain architects and word of mouth. For instance the first catalogue was produced in 1879, only superceded by the second edition in 1906. Principal architects dealt with were E. Paley and H. Austin (also of Lancaster, and near neighbours), Demaine and Brierley in Yorkshire and G.F. Armitage. A dense highly colourful style was developed very similar to that of Morris & Co., and Powells- both near neighbours to the London office. Under Hunt the company was very important and successful. 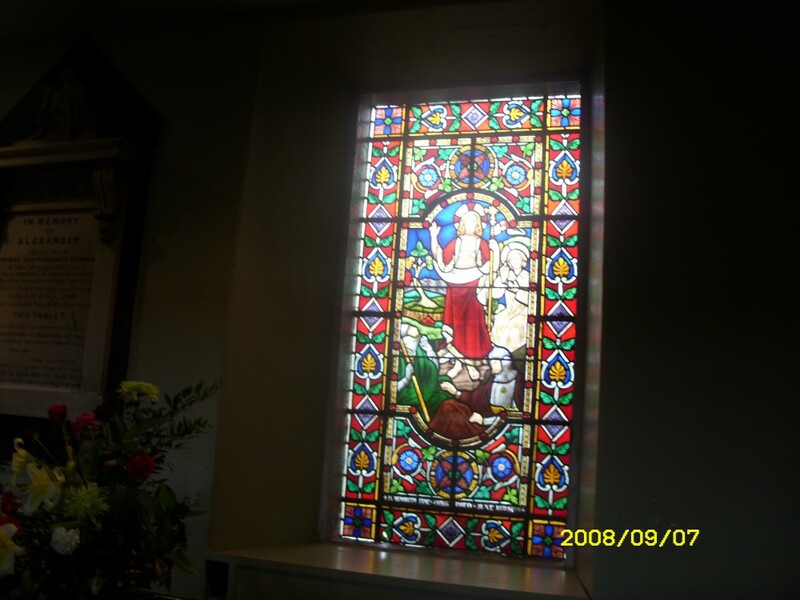 In Cumberland 20 churches have S & H windows including Seascale, Mosser, Wasdale and Workington Holy Trinity. Local secular examples are Westmorland Grammar School, Kendal and Barrow Town Hall. Further afield many P & O Ocean Liners (as they were in those days) were furnished with their glass, and foreign churches supplied ranged from Germany to the Canary Islands, South Africa, Rangoon, India, Canada and Australia. Upon his death Hunt was succeeded by Arthur Edward until his death in 1929. Unfortunately Hunt was an autocrat and strong disciplinarian- this led to strained family relationships. Therefore, in spite of having such a large family none of his sons was willing to take over the business (indeed one son was permanently estranged, and another set up in competition in Lancaster). Also there had been an undue reliance on Almquist and Jewitt. Thus with three key players leaving/dying in the space of 7 years the business began a long decline, under the new ownership of Charles Frederick Turner (who had served the company since 1884)- until his death in 1943. This process accelerated under a succession of owners thereafter. In 1959 the company downsized to new premises at 43, West Road Lancaster. The third floor of these premises was let to the Vehicle Licensing Office. During a break-in to that office in 1973 a fire was set which destroyed the whole building, including very many of the companies records. The then owner moved what remained to his own home “Lowwood” where he continued a small scale one man business until his death in 1982. His family then liquidated the business on 5th August 1982. The glass furnaces were rediscovered in the basement of 23 Castle Hill in 2003. A definitive listing of installations at publication date can be found in the 1936 Company publication “Notes on Stained Glass” (PRO reference DDSr/11/12), which contains but a few illustrations of their work. The dates are found in the ‘Register of Designs 1877 to 1964’ (PRO reference DDSr/3/1).This booklet also provides a description of the method of manufacture. Readers were invited to Castle Hill to witness the manufacturing at first hand. Very briefly a sketch is produced. This is then converted into a cartoon (after approval by the client)- an exact size charcoal enlargement. An example of a window and matching cartoon can be seen in the Lancaster City Museum. A pattern is then produced to show where the leads will be (the cut-line). Brown pigment (powdered oxide of iron mixed with water to form a paste), is then used on the inside face of the glass to paint figures and faces. 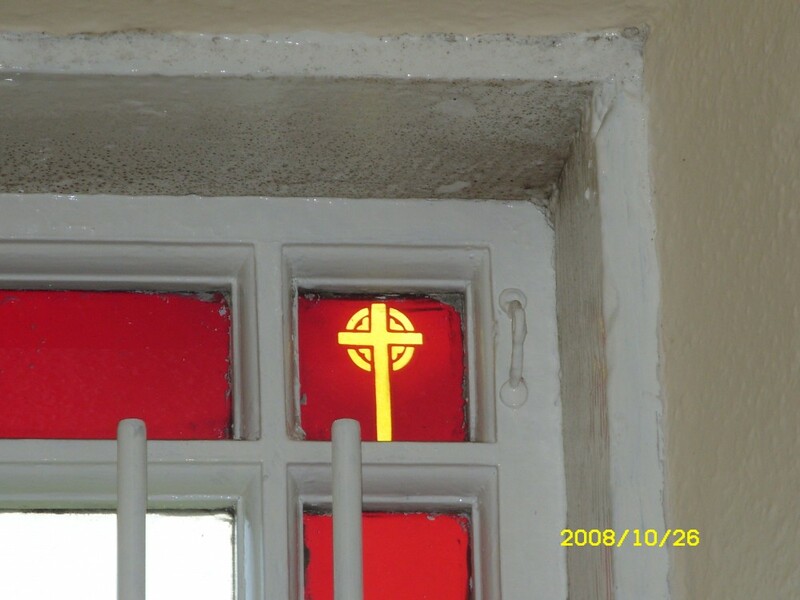 All other colours are applied to the outside face of the glass. After inside and outside painting the glass is then placed on asbestos trays and fired in the kiln. After firing the glass is returned to the painter to improve and remodel, then fired again. If any silver staining is required this is applied after the second firing, then fired for a third and final time. Finally the glass is sent to the glazier for assembling, soldering and cementing. The other key publication (used extensively here) is Stained Glass from Shrigley & Hunt by William Waters ISBN 1862201404. The surviving company records are at Preston Record Office. The key to interpreting these is to use the Design Register to identify the dates then the General Ledgers (PRO DDSr/1), which are arranged in Client Order by first order date, rather than in sequential date, making their use very easy. Abbot’s were also based in Lancaster (with a London Office)- at the St. John’s Studios, 11 Chapel Street, Lancaster (The redundant St. John the Evangelist Church is opposite). They were established in 1860 as a plumbing, glazing & gas fitting company. 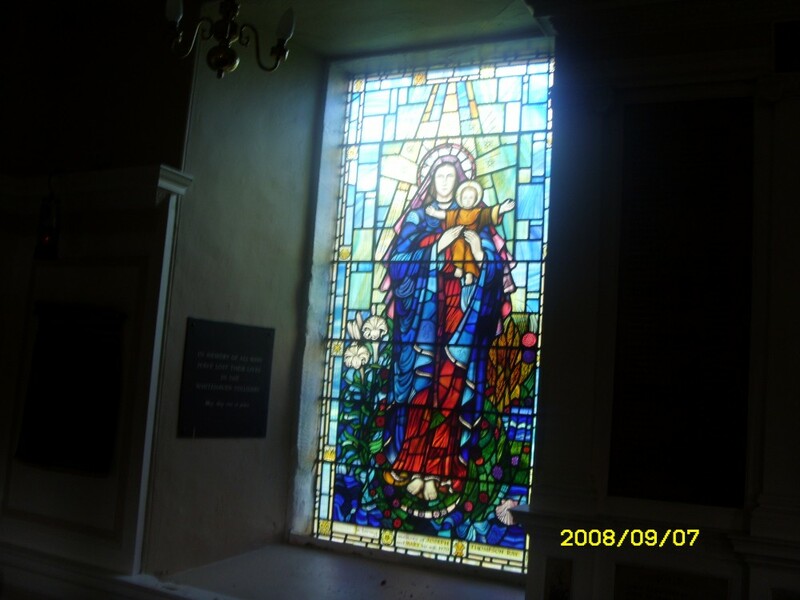 They moved into stained glass after the retirement of the founder William Abbot. As well as Church Work their staple business was work for private houses and businesses. They also produced brass memorial plaques. Until the turn of the twenty first century they remained at Chapel Street. The company survives as a separate trading entity within the larger group ’Great British Lighting’ and has moved to modern premises at Denham Way, Fleetwood. Their old premises is now known as ’The Glass Works’ and is home to several small businesses. Their surviving company records are also in Preston Record Office (reference DDAB). However they are not indexed, or sorted. Inspection shows that they are not at all comprehensive, and therefore not particularly useable for research purposes. The Record Office does have an undated catalogue from them, which in it’s list of Church installations mentions 2 windows at St. James. As our first known windows date from 1924 and 1935 this dates the catalogue as being in the years preceding the Second World War. 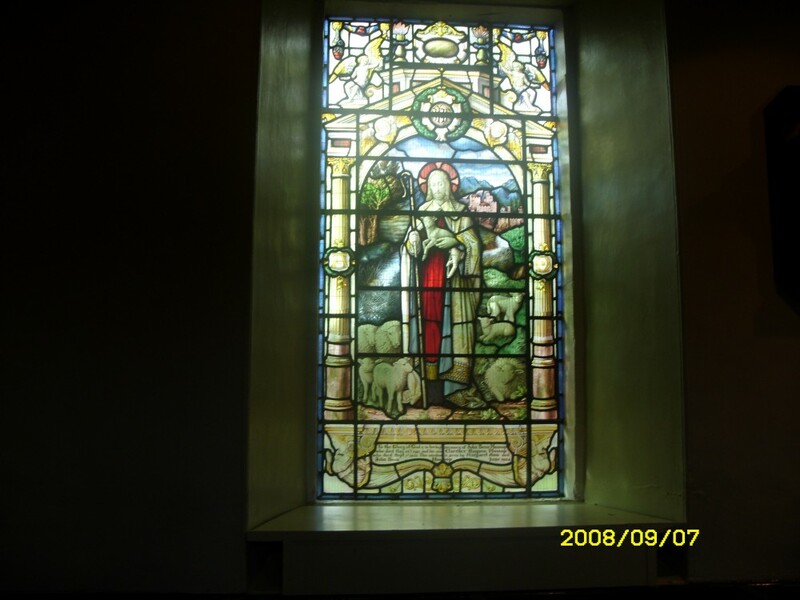 From that catalogue we can also establish that there are Abbot’s windows in the following Cumbrian Churches, at least: Beckermet, Cleator (cost £160 and pictured in the catalogue), Distington, Ennerdale, Field Broughton, Setmurthy and Tebay. Overseas work included Constantinople (Istanbul), South Africa, Rangoon (Burma, now Myanmar), Malta, Jamaica, Ceylon (Sri Lanka), Newfoundland and Nigeria. 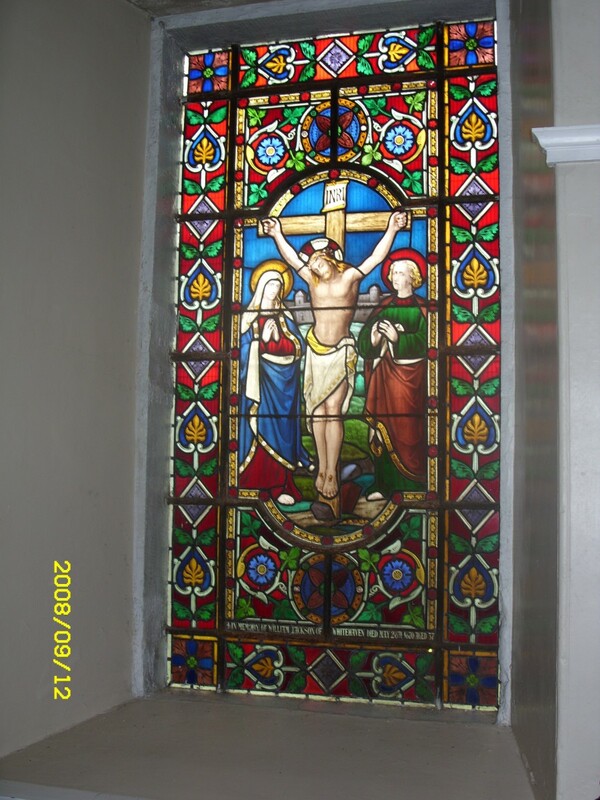 At the time of the catalogue typical costs for a Stained Glass Window are cited as £4/10/- to £6 per square foot. From time books we know that typically 12 to 16 craftsmen were employed at one time (fluctuating up to 24 at times of peak demand), and falling to two men for the duration of the Second World War.